How Much Do Carmakers Spend on Ads During NFL Games? The simple answer is: more than any other industry—by a lot. This article originally appeared on TheDrive.com. Some of the best advertising in the history of cars—and just about everything else—has been introduced during NFL games, oftentimes the Super Bowl. The media landscape today is a riddle of shifting platforms, perplexing revenue trends, and a fickle audience increasingly difficult to nail down. And yet the most valuable ad unit out there is still the tried and true: a 30-second spot during a pro football game on network TV. For car makers, the NFL game is a perfect mix of the right audience—and a lot of it. And so every year during buying season, the in-game inventory flies off the shelves, breaking price records in years when most other slots are going for less. A single 30-second slot during a primetime NFL game starts at $717,375 apiece, with big marquee matchups costing considerably more. 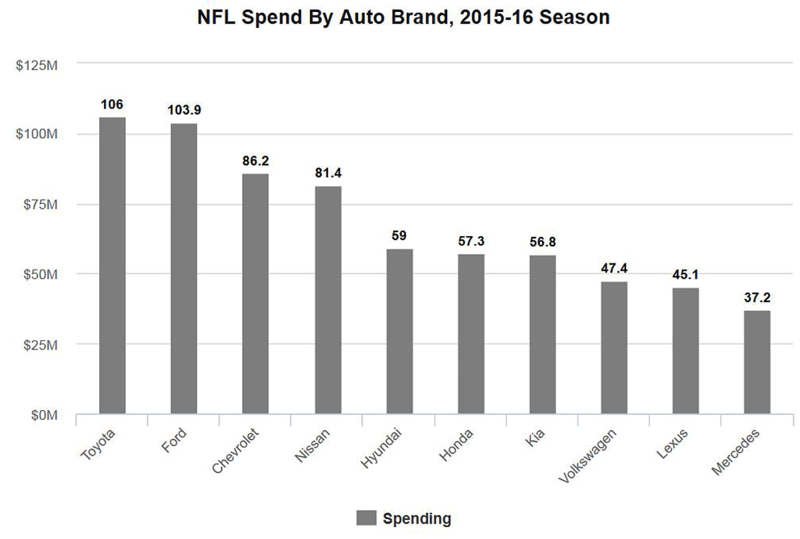 Last year, according to Automotive News, the automotive industry was by far the NFL's top advertising client. Ford is the new officual title sponsor of the NFL, and Hyundai corporate sibling (and sponsor of NBC's "Sunday Night Kickoff" pre-game segment) Kia "splurged on three :30s in support of its 2017 Sorento, while Mercedes-Benz, Jeep, Chevrolet, Toyota, Volkswagen and BMW." According to Nielsen live-same-day data, last season's complete Sunday night slate averaged 22.5 million viewers. But that's actually modest compared to Fox's NFC lineup, which averaged over 27 million viewers. So which car companies spend the most on football ads? The surprise is no surprise to Monday Night Football fans, who've seen a raft of Toyota ads float past every MNF broadcast for the past 11 seasons. During the 2015-16 season, Toyota spent $106 million, followed closely by Ford at $103.9 million. Chevy ($86.2 million), Nissan ($81.4 million) and Hyundai ($59 million) round out the top five. All told, the car manufacturers spend nearly $1 billion buying ads for NFL games, which is a significant portion of the total annual marketing spend by car makers in the United States. So much for cutting the cord.